http://www.kwernerdesign.com/blog/ - I've referenced Kristina Werner's site several times and did a couple of her color challenges. There is a new card and video posted every Monday and Friday. 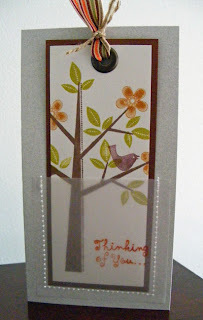 http://www.firefliesandflutterbyes.com/ - Tara Kieninger is a Stampin' Up! demo also. She has cool techniques and lots of scrapbook pages to browse. She just moved her blog's home so use this link to find her. She has some Blog Candy for a drawing until early Sept.
http://stampinpretty.typepad.com/ - Mary Fish was profiled in our demontrator's Stampin' Success magazine and I've been following her detailed blog ever since. She posts new projects every day. http://scrapbooklady.typepad.com/ - If you are a scrapbooker, you can't beat Katie the Scrapbook Lady. 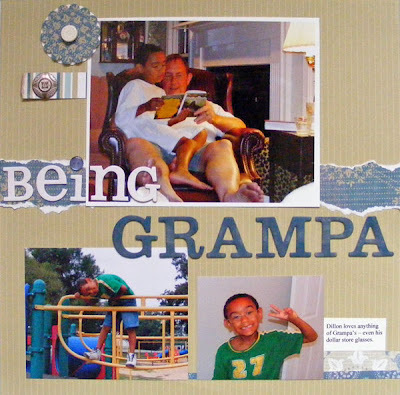 She has one of the first blogs I found on scrapbooking. These are just a few of the great blogs out there. These cards have been very popular on card sites for months. I've been wanting to do one and the perfect opportunity came up. This was made for my godmother, Betty's, birthday. Typically the flowers are more attached to the insert than the 'pot' but I did the opposite and made a skinny insert. It serves as a bookmark to go with the books we gave her as a birthday present. I chose books I'd read and knew she would enjoy: A Nicolas Sparks novel and Blessings by Anna Quindlin. Happy Birthday, Betty! Hope you enjoy many, many more! Button: Large red is Riding Hood Red from Stampin' Up! Now that the kids have been here for this year's visit, I'm finally finishing last year's pages! Actually I am further along with the 2008 album than I thought. I really don' t lack that many pages so now I'm anxious to get it done. I'm always excited at the beginning and the end of a project, it's that middle ground bogging me down every time. You know how when you use the scallop edge punch you get that little leftover strip of paper? And we always say to keep all your scraps. Well, you really can do something with that strip often on the same project you already punching a scallop edge for. 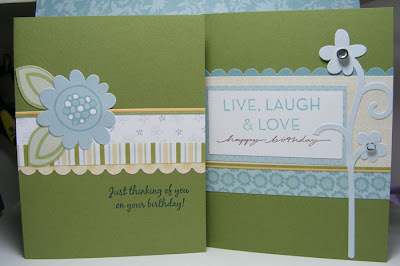 The card above has a little strip of melon mambo designer series paper to unite the other papers. It is the little strip left from punching the scallop from pumpkin pie/crushed curry paper. Flip it over. A nice simple, cheap finishing touch in the perfect size - and a tiny bit less trash. Here are a couple of cards I made for my Mother's card stash. 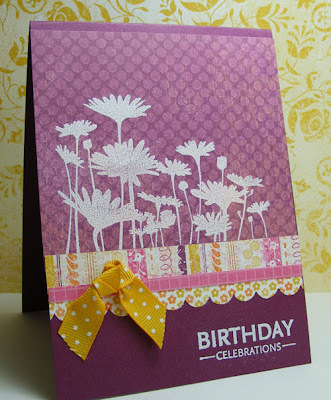 There is very little stamping since the design of the designer paper is the key element of each card. Get in the Christmas spirit and make 10 great cards at my Christmas Stamp-a-Stack on Saturday, September 19. You will make 10 cards - 2 each of 5 designs. Cost is $15 and includes all materials. Here are a couple of the cards I've designed so far. Call or e-mail me to reserve your spot! I'm on a "use it up" kick. 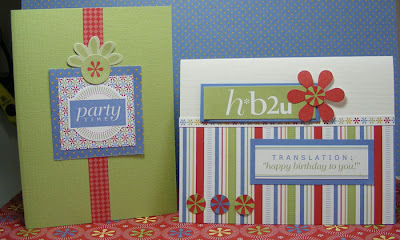 Last week I was making class cards using the Happy B-day Simply Scrappin' Kit. My mom needed more cards for her stash so I pulled out my Sunshine Garden Simply Scrappin' Kit from last spring and made these cards for her. The "sun" here is made from cutting out around the part of a yellow flower still left on the sticker page. I got to break out the Vanilla Hodgepodge Hardware! Ooh, I just remembered I have a bunch of So Saffron ribbon that would match this kit. I'll go for it the next time I'm playing with these papers. 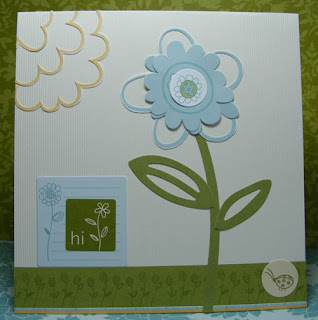 Ingredients: Sunshine Garden Simply Scrappin' Kit from Stampin' Up! 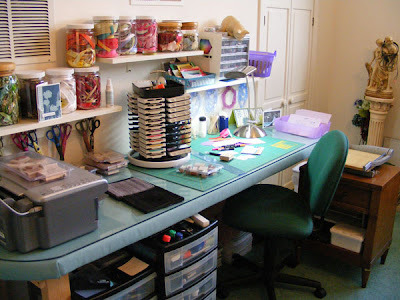 Yesterday, I switched some things around on my paper crafting worktable again. Mainly I "flipped" the arrangement to put the nightstand I'd been using as a printer table on my right to become my paper trimmer's table. I don't use this particular printer nearly as much as I used to thanks to many more word stamps and a newer wide body photo printer. I really like this arrangement. Of course, I think this everytime I switch things around. Needs change, I acquire more toys - ah, I mean tools, and sometimes I just don't have it right. One thing I know for sure: If you are constantly cleaning up a space so you can get work done, getting up and moving around too much or you can't find anything, you aren't there yet. Fortunately, I love to organize. Strange I guess from a person who hates to clean. Maybe it is karma's way of making me clean up anyway. Since I started in papercrafts as a traditional scrapbooker, I had quite a stash of 12"x12" paper. 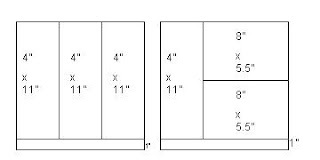 I soon found that a standard card size for card makers was 4 1/4" x 5 1/2" which is a split of an 8 1/2" x 11" page. So what is the best way to use all that 12x12 paper without too much waste? Simple, just make the card 4" rather than 4 1/4" x 5 1/2". By sacrificing that little quarter of an inch you can cut 3 cards from a 12x12 page. Depending on where you get your paper, that can be an even better value. You'll never notice the difference in your card size. Another consideration is fold. 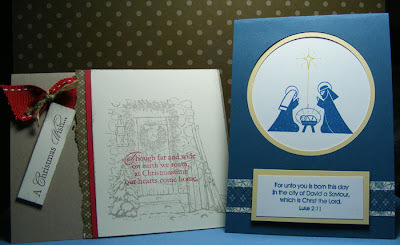 You will need to fold at least one of your cards so that a 4" x 5 1/2" card is folded at the top rather than the side. Here are two possible ways to get 3 cards from a 12" x 12" sheet. First cut a 1" strip off of one edge of your 12" x 12" cardstock. Then turn the cardstock 90 degrees and cut a 4" x 11" piece. The remaining piece can be split either way to create two more cards. I started doing this to use some of my 12"x12" cardstock for cards. Now I often buy paper in 12"x12" so I can have the option to use a paper as a background for a scrapbook page or for cards. The card on the right uses many materials from the kit including the package in Certainly Celery and Ruby Red. 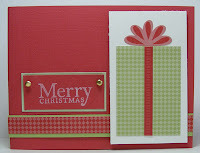 I turned it into a Christmas card by using only Red and Green from the kit and adding a Christmas greeting. The card top left is a birthday card only because of the sticker from the kit. 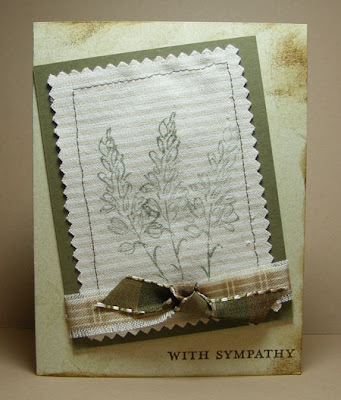 A different message or a flower in place of that message and the card can be used for another occasion. 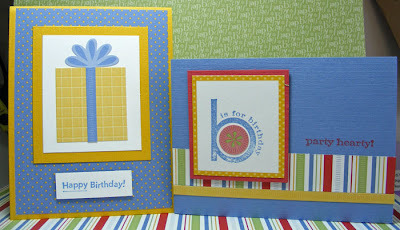 Ingredients: Simply Scrappin' Happy B-day kit and all other materials from Stampin' Up! Last weekend, I mentioned how hot it was in my scrapping space and how I just had to grab a few supplies and take refuge in our dining room downstairs. 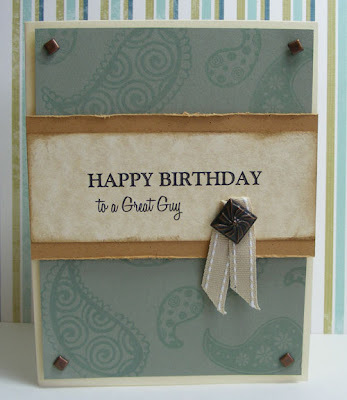 The most portable project I had was my Simply Scrappin' Kit card class using the Happy B-day Simply Scrappin' Kit from Stampin' Up! There are many reasons to try out one of these kits for making cards and portability is just one of them. The kit comes with 6 sheets of designer paper in 2 different styles, 8 sheets of cardstock in 4 colors and 6 sheets of adhesive die cuts - 'thicker stickers' or stickers with class. 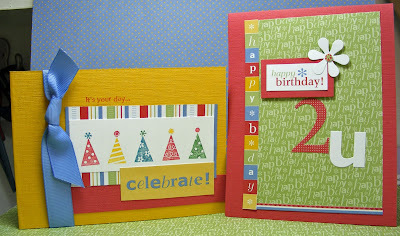 You can make 20 to 24 full size cards with one kit for $19.95 + tax and shipping! And you can do it really fast, too! 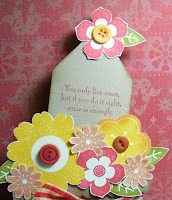 Here is my take on a Happy Retirement card using the now retired, Office Accoutrement Set. The inside message says: "Let the relaxation begin. Happy Retirement." Hopefully the recipients desk won't be littered with too many to-do lists. 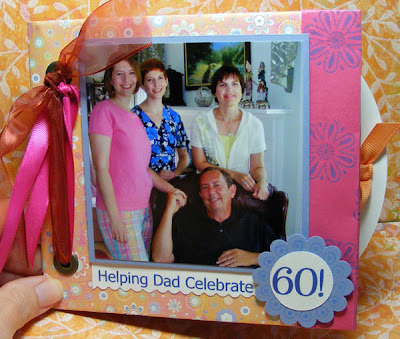 The card size is 9" x 4" to fit in a #10 envelope. 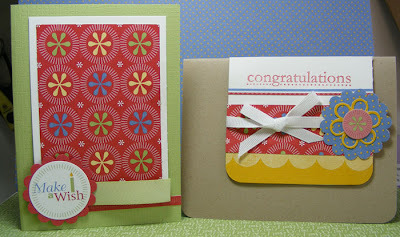 Ingredients: Stamp Sets: Office Accoutrement, Congrats from Stampin' Up! Inks: Really Rust, Soft Sky, Sahara Sand, Chocolate Chip, Close to Cocoa. Paper: Notebook DSP, Soft Sky, Real Rust DSP from the Hostess Set paper pack in the current catalog. Recently I took an intro class at BigPictureScrapbooking.com. This site was started by Stacy Julian former editor of Simple Scrapbooks magazine - my fav that ceased publication earlier this year. 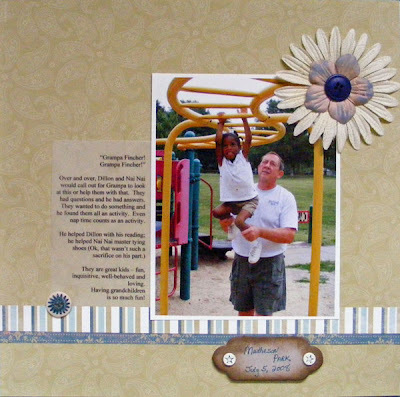 The class called " Start Here, with Stacy" is an introduction into what their philosophy is at Big Picture Scrapbooking, an on-line training site. I've also signed up for a couple of other classes. In this first class, Stacy has you take a quiz where she asks lots of questions about what kind of products you have then what kind of scrapbooking you do. I don't want to reveal the punch line to this but you figure it out pretty quick and it is enlightening. It made me think about some things I've been meaning to scrapbook for awhile now and some things I'd never even considered capturing. One of the questions in the quiz gives points if you have ever scrapbooked your favorite possession. It is hard to nail down my absoloute favorite but I can give you the top 5 or so. What are the things you would grab if you only had 5 minutes to vacate your home? I can tell you this, it couldn't be clothes - unless I wasn't wearing any, i.e. just got out of the shower. We actually had to do this a few months back when there was a tornado supposedly right on top of us. Nothing ever touched down but I grabbed my stuff and headed to the basement. My list: my scrapbooks - as many as I could carry, my grandfather's pocket watch, my grandmothers' and my husband's mother's quilts, as many as I could pile on my husband, one set of decorative figurines and my laptop. While I wouldn't want to lose all my other stuff, those are the irreplaceable objects. Ok, maybe not the laptop but it would be a hassle and it was right there for easy moving. Unfortunately, furniture couldn't be moved so easily and there are a few items I'd hate to lose. 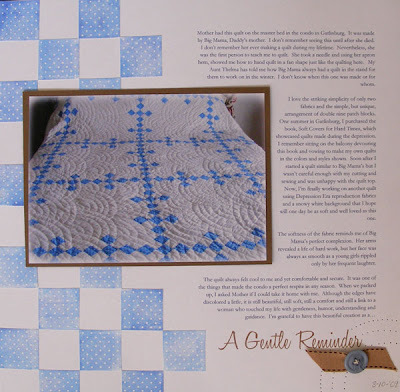 So when I decided to do a page on at least one of my favorite things it was easy to pick out a quilt that had great sentimental attachment as well as great beauty. This quilt was made by my Dad's mother and I captured in my page how it came to my possession, my history with it and what it and a little of what its maker means to me. I guess that truly is the "Big Picture." 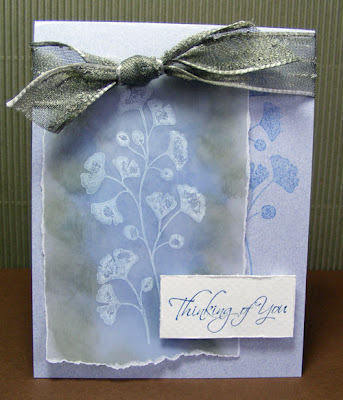 Ink: Ballet Blue by Stampin Up! Ribbon and button: Unknown sources. I CASEd this card from Splitcoaststampers. My change was to stitch the vellum pocket in place rather than using brads. I used the 3" x 6" size so it would fit in one of the open end envelopes. The card does double duty as a pick me up and a bookmark. Grommet: Antique Brass from Stampin' Up! Ribbon: Unknown manufacturer; Stamper's Alley was source. I've let the day nearly get away. Today, I've finished up cards for a class and actually made cards to send off to people in my life who have events coming up - the real reason for doing this engaging hobby in the first place. However, I didn't completely forget about Tuesday's tip; just no time for photos. So let's talk about paper storage. I've tried all kinds of systems and what I keep coming back to are the clear 12x12 paper storage envelopes by Nicole. They have string closures. I get them at AC Moore for $1.99 each. Stampin' Up! also sells a similar product. I admit that I haven't tried them; I've had the others for years. Envelopes are preferable because you can store not only the full sheets in fairly large quantities but also all those little bits you save from projects. And these clear envelopes are great for projects in process. I put several paper colors per envelope - usually at least 3 or 4 from the same color grouping; i.e. Earth Elements, Soft Subtles, In Colors, etc. 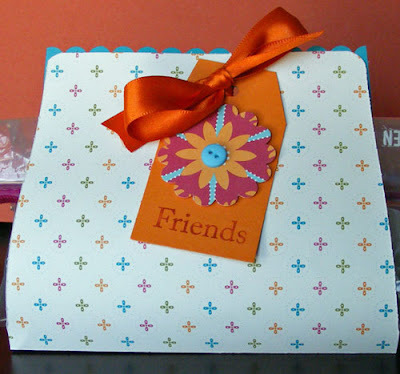 I create a label on the outside of the envelope with the color names in that envelope. Then I store all these one of those multi-shelf paper storage systems you can buy at the craft stores. I keep the Neutrals, In Colors and current designer papers on top. Then in the next section I have all the basic colors with past In Colors and discontinued designer papers on the bottom. Typically there are two envelopes per shelf. This system works for me but I'm always looking for more ideas on paper storage. Feel free to leave comments. Thanks. Summer has more than arrived in NC. It's hot! 93 degrees in the forecast today + NC humidity and I'm staying indoors where the AC is running, thankfully. My scrapping space is in our attic bedroom. I love the light, privacy, the storage I've wrangled from every drawer and inch of closet space, and most of all that I can leave a mess and no one sees it. The trade-off for this bit of crafty heaven is a taste of the other world. It gets really warm up there. So Saturday I packed up a couple of boxes of supplies and am camped out downstairs until things cool off. Fortunately I had dinner with a friend last night to distract us from the climbing temperatures and growing to-do lists. The photo is a little hostess treat bag I made using a half piece of designer paper, a couple of punches and a little scrap cardstock and ribbon. Also while I was staying in during the hottest part of the day, I read a book by Sarah Strohmeyer, The Secret Lives of Fortunate Wives. I consider myself very fortunate but not in the same sense as these women but then I don't have their secrets, thankfully. I like her more recent books a little better. Still this was enjoyable and part of the plot seemed to be ripped right from the headlines except she wrote the book before certain current events came to light. Not only an entertaining writer but insightful too. 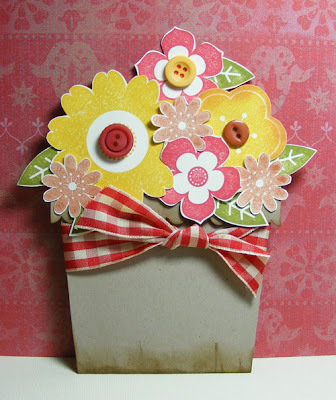 Stamp: from Make It Count by Stampin' Up! Ribbon from Hobby Lobby, I think. Deal alert! Several Stampin' Up! products will be sales tax free this weekend for those of us who live in NC. Give me a call by Sat evening if you want to order any markers, watercolor crayons or pencils, scissors and the all important, always needed ADHESIVES! Saving 7% is always a deal! This will probably be version 1 of a thousand. Medallion is one of the most popular stamps of the new Stampin' Up! catalog. I knew the first time I went through the new catalog that I would have to have it. 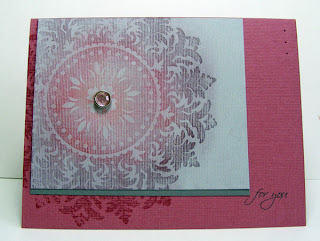 Here is my first take on this stamp using Stampin' Pastels to create the various shades of pink and burgandy on a light gray textured cardstock. The design for this card came from the IBC or Idea Book and Catalog. Sometimes I forget that it is more than a catalog. 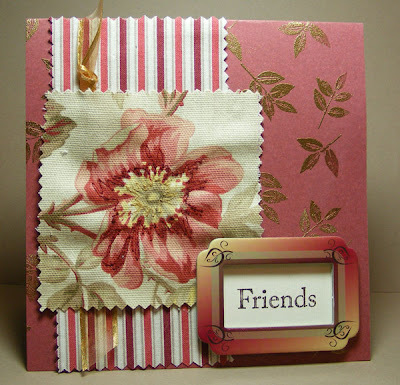 There are so many wonderful cards and projects we can copy. I changed the colors and greeting. Their version had stitching and I used the paper piercer for some minor detailing. Ideas are just that 'ideas' - a starting point you can alter as much or as little as you want to make your own creation. 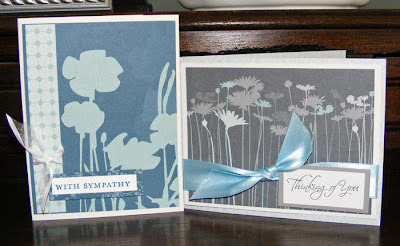 Cardstock: Basic Gray and other colors from unknown sources. A few weeks ago, my stepdaughter Jaime asked what happened to the photos we took during her and her sister's visit in June. The short answer - "nothing." I took the photos, downloaded them to my computer and that was it. Since my husband was going to see his daughters this month, I thought it would be nice to make them each a mini album to commemorate his birthday and their visit. I also thought I was going to have about 10 days to get these done. Not quite. A change in scheduling (mainly to accommodate my other business so I can't complain) meant I would have only 2 days to make 2 albums! Yipes! Use the same materials for each album. I scoured my papers until I found enough of the same paper that would match my photos and do both albums exactly the same. If possible, choose papers that not only compliment the photos but add a little zing all their own. You won't need to embellish very much. Select 2 or 3 companion papers. Keep them handy and resist the urge to keep digging through your stash for more stuff. You do not need to mat all photos on small albums. 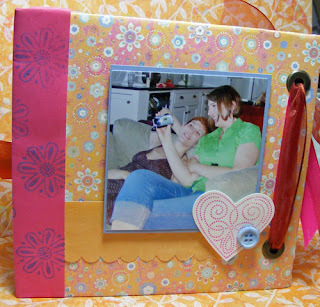 The photos have to be small for mini albums anyway so mats take up extra space and extra time. 5. 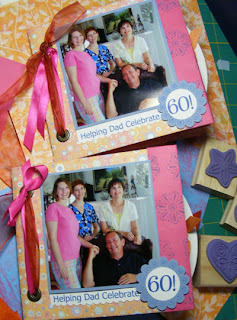 Choose one or two embellishments and use throughout the album. 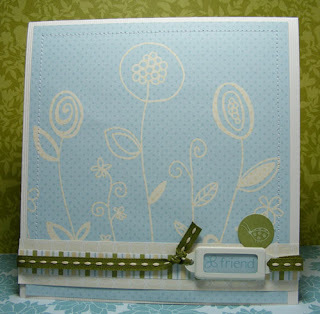 I used the Polka Dot Punches stamp set and companion punches to create my embellishments. A few buttons and that took care of the pages. 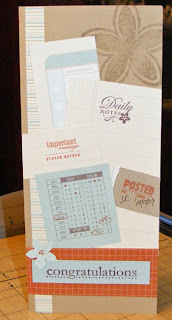 Print or write all journaling on one color of cardstock; use one font, one color and one size wherever possible. In my case I did white and used ink to brush the edges with a little color. Most importantly, do each step for each album. In other words, don't complete one album and then start on the next one. I folded all the papers for both albums, then I punched all the holes and added the grommets, then I cropped the photos for each album, etc. It is tempting to see how one thing turns out before going to the next; that leaves two problems. One, it takes too much time. Two, are you going to change the 2nd album to 'fix' what you didn't like about the first? Then who gets the better one? My only variations were in how I tied the ribbon (the last step) and in some off the tags I inserted which have some extra photos specific to each of the girls. And of course a couple of hours after I tied the last ribbon, I found out he wasn't leaving for one more day! Stamps: Polka Dot Punches from Stampin' Up! Round and round I went last weekend trying to get a pretty card design with the Cheep Talk stamp set that I had been coveting for months and had for weeks and was finally using. This is unusual for me because nothing sits on the shelf in my house unused for long. I tried one design I'd CASED - it looked OK but was just too tedious to make the 5 or 6 cards I needed. Then I tried this layout with a couple of different paper families. Finally I settled on this one. I love them! They were time consuming with all the different stamps but not difficult. 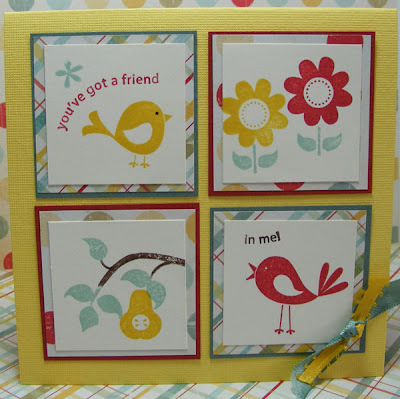 I love all little birds and their accessories so it was an enjoyable group of cards to make. The colors are really happy, don't you think?